Today I am simply playing with my newest blends colours and chatting with you. Please see the video below and the link to all the blends in my online shop that is open 24/7. 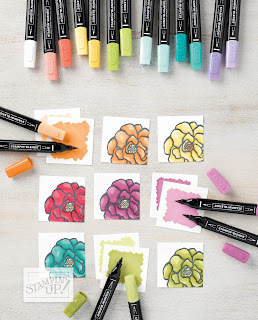 CLICK HERE to see the video and brief description of the new Stampin' Blends. I love the blends and how easy they are to work with. I am slowly learning the watercolour techniques but I can say for certain that alcohol colouring has absolutely become my new favourite medium to use. The way SU have released colours that combine to make the shading process easy makes me get so excited for all the future possibilities ahead for my crafting and projects. They are great quality, a great price and perfect for stamping colourers. I HIGHLY recommend the blends for those with hand issues. The lids are rather tight so have someone open and close the lids a few times to loosen them and then off you go!